On TV, the 1970s looked a lot like the 1950s. At least, that’s how I remember it forty years later. Some of the most popular American television programs at the time included the Eisenhower-era sitcom Happy Days and its spinoff Laverne and Shirley, while the variety show Sha Na Na offered viewers wary of Dance Fever and other symptoms of the disco plague a helpful antidote of ‘greasers’ singing doo-wop hits. The fifties were also a hit on the big screen, as evident in the success of Grease and (pre-Star Wars) George Lucas’ American Graffiti (the latter film’s setting of 1962, the year before JFK’s assassination, marks it as set at the end of ‘the long fifties’ rather than as a representation of the 1960s). I flashed back to this 70s/50s media connection not long ago, when watching the hit Netflix show Stranger Things. It’s tempting to quip that the title is wildly inaccurate, as there’s no shortage of familiar sights and sounds in the series. From the Stephen King-inspired font of its title and its John Carpenteresque analogue synth score to its nods to the plots of The Goonies, E.T., and a host of other 80s films, the program is a Valentine to the 1980s from today’s forty-somethings. Its success as a nostalgia vehicle derives in part from the very specific strain of eighties-itis it puts under the microscope. 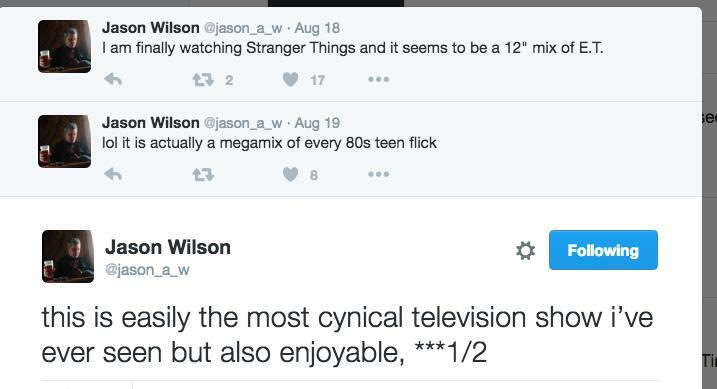 Bypassing the more familiar touchstones of the era such as the pastel bling of Miami Vice and the blousy androgyny of the New Romantics, Stranger Things taps into the suburban horror of King, Carpenter, and Wes Craven as well as the nerdy adolescent fantasy worlds of the classic role-playing game Dungeons and Dragons. Set in a small town in Indiana in 1982, the more-than-slightly-ridiculous-when-recounted plot of Stranger Things features an American government agency harbouring a child-abducting Lovecraftian abomination from another dimension; a shaven-headed, waffle-loving pubescent girl with weapons-grade telekinesis; and a group of plucky high schoolers committed to unearthing the conspiracy and saving their kidnapped friends. No doubt for many of the viewers, the show’s resuscitation of Hollywood teen archetypes (a la The Breakfast Club) provoked a reaction somewhere between bittersweet nostalgia and bullying-triggered PTSD, a sort of return of the repressed for ex-nerds binge-watching late into the night before rising early to take the kids to swim lessons. Nostalgia, in most reckonings, is synonymous with escapism – ‘history without guilt’, as cultural historian Michael Kammen put it. With respect to 1970s nostalgia, for example, we can readily imagine reasons for people then wanting to revisit the 1950s: to repress the trauma of the Vietnam War, perhaps, or to hark back to a time before Second Wave feminism and the more confronting and angry Black popular culture of funk music and Blaxploitation cinema. Whatever explanation(s) we settle on, however, it is clear that the culture industries of the period were tapping in to a desire on the part of consumers to revisit their youth. All of which begs the question: is there something about our present age that fans of Stranger Things want to escape from? The nostalgia in Stranger Things is in marked contrast to Netflix’s other major release of the northern summer, the fourth season of Orange Is the New Black. Netflix’s prison dramedy offered no escape from the America of 2016, as it confronted the racist violence of the state and its contracted private penitentiaries. Of course, not every television series need strive for such topicality, but it is a curious and undeniable fact that our current decade rivals the seventies for nostalgia: it seems that scarcely a month goes by without the release of a new Marvel or DC Comic-inspired blockbuster, and some (alleged) adults seemed so fixated on their childhoods they grew apoplectic when it was announced that all the principals in the Ghostbusters reboot would be female. The reactionary nostalgia of these nerdy Neanderthals suggests that as a culture we haven’t progressed very far from the seventies’ simplistic adoration of white-bread 1950s popular culture. Despite all this, it is important to consider that nostalgia may have an important cultural function as well. Recent academic writing on nostalgia has sought to recuperate nostalgia, to speculate that nostalgia might signify more than reactionary disdain for the present. According to Janelle Wilson, nostalgia can offer a ‘sanctuary of meaning’ in uncertain times, reassuring us of the stability of our identity when it seems the centre cannot hold. In The Future of Nostalgia, the late Russian critic Svetlana Boym distinguished between ‘restorative’ and ‘reflexive’ types of nostalgia – the former fixated on restoring the home or nostos of a mythic past; the latter encouraging reflection on the inevitable aching or suffering (algia) that accompanies lost times. Such meditation can begin with a recognition that nostalgia always seeks its own extinction: what we desire is not so much a lost age but an age when we were incapable of nostalgia. This is one reason why childhood looms so large in our memories – we yearn to return to a time when we had less ‘past’ to mourn, less reason to suspect that we had lost something. Most people really have no desire to return to their childhoods, much less to the awkwardness of their high school years. The ultimate objects of the show’s nostalgia are the films and music through which we processed the world back in the day, the mediated nature of these memories furthering the reflective distance with which we revisit our lives; for nostalgia describes not so much the urge to sit out the present but to dance its steps in the more familiar rhythms of the past. Netflix of course is a paradigmatic manifestation of this non-palpable, digitised means of cultural distribution. In a revealing behind-the-scenes anecdote, Shawn Levy, the executive producer of Stranger Things, explains that Winona Ryder – once Nineties It Girl, now cast as middle-aged mum – didn’t know what digital streaming was when she was approached for the part. Jim McCormack is a Melbourne-based writer. His current research interests include representations of memory and gender in cinema. This is a really neat write-up, I particularly love the idea of nostalgia as a longing to return to a time at which there was less ‘past’, and therefore less potential for loss (and then by extension, less potential for nostalgia). Makes things interesting when you then start considering the journey of the nostos of nostalgia, and try to identify a point of origin (or destination), since a self is continuously evolving (and really only exists in the present moment as a product of all previous experiences).